Our wreath this year looks tiny on this door. I'll have to replace it come next season. Let's go downstairs first...our family/tv/play area. Downstairs is where the red is at. 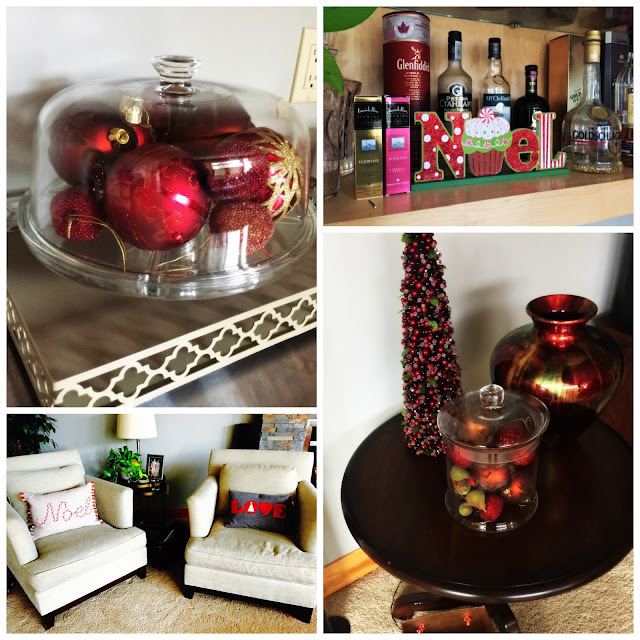 I had to find new and creative ways to use what we had and fill our space instead of buying tons of new. And then we head to the main floor where we spend most of our waking hours. The space this year is very different from the last house so we used white, light decorations. 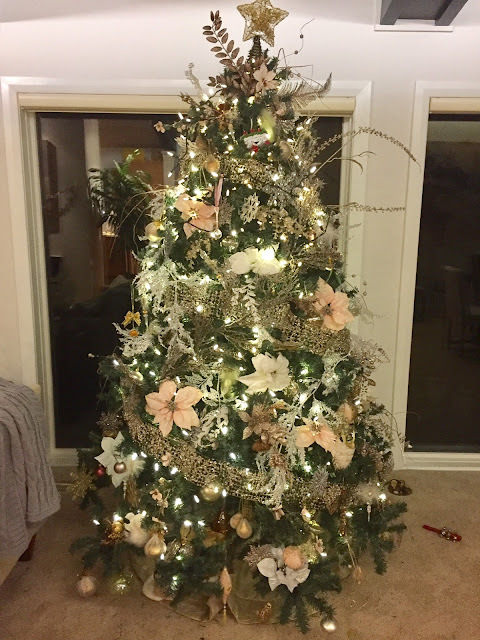 I covered two hard covered books with gift wrap to add some height to this tree. Can you tell I bought a bunch of fronds? Our tree this year-- we did pink, pewter and gold like we did for the past few years and then added lots of white and shine. I found this crystal garland at Marshall's and bought a couple to lighten the tree. 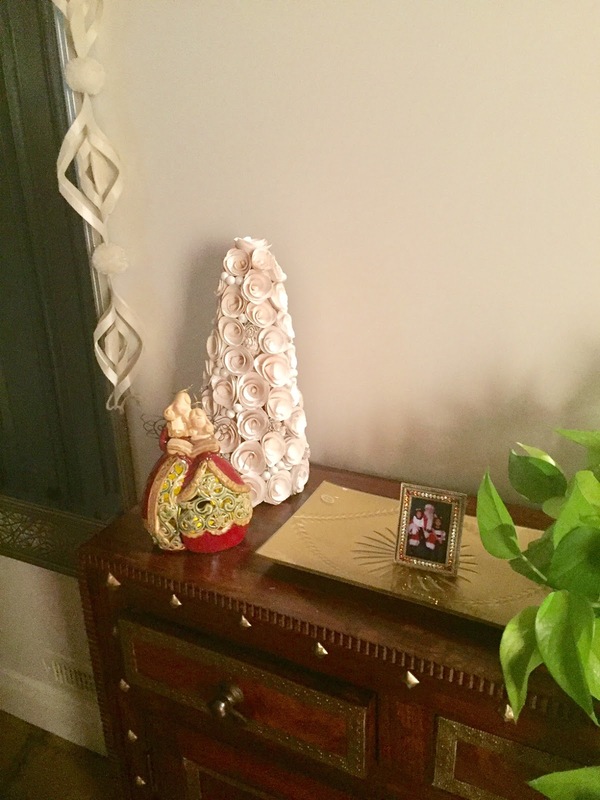 Linking up for TWO different decor link ups with Beth and Andrea. Love, love, love! Those fronds are so pretty and that crystal garland is too. Its also fun how you have different color themes between the downstairs and the upstairs too. 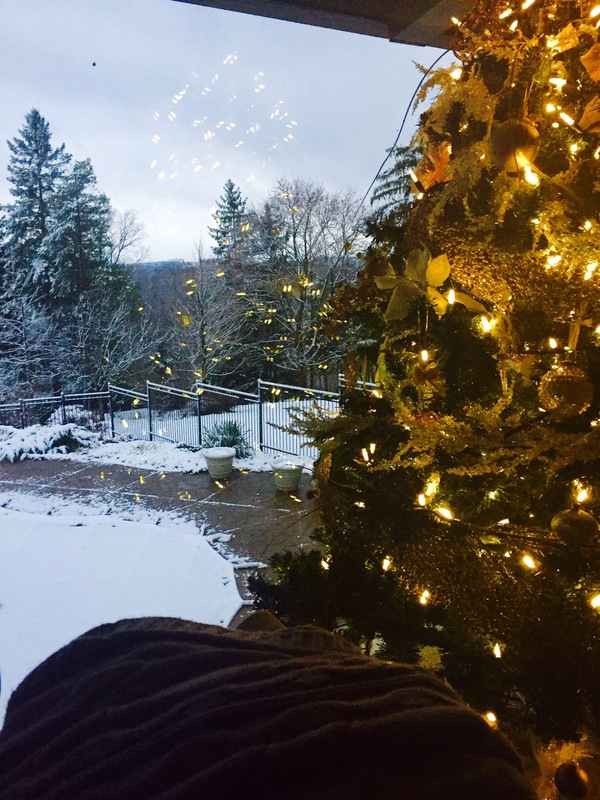 The view outside with your tree and that beautiful, wintery white; I love it! I wish we had that much snow. So many great little pieces! The French sign is a good touch, I will need to find something like that now that E is in French immersion. Merry Christmas! Love how you covered the books to add height - just a good idea! Loving those little trees, too! I love the planter by the front door, gorgeous! Your tree is pretty and you are so lucky to have snow! Your house just has such great bones! 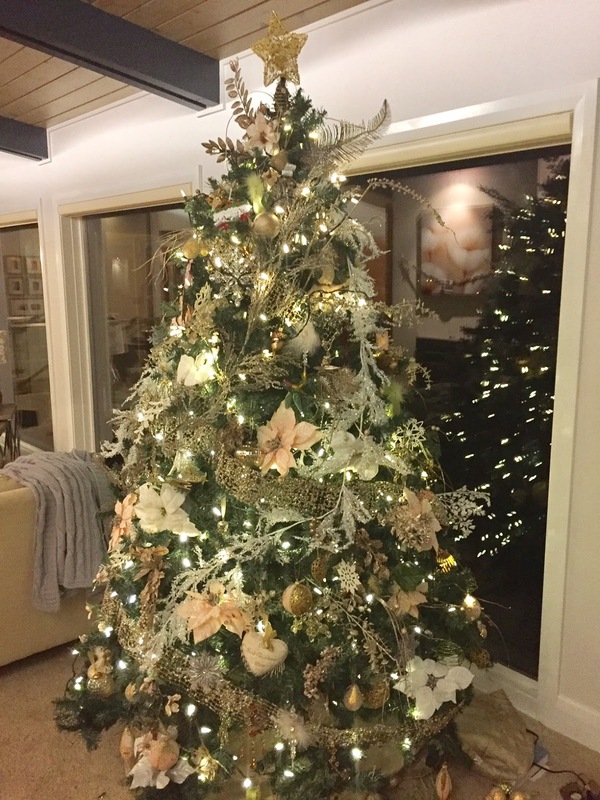 I am loving your beautiful tree and the view!! Love the gold and pewter on your tree and the snow that I already see! 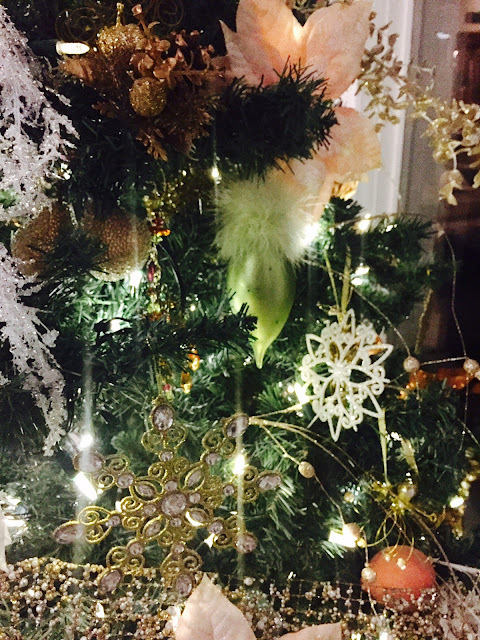 Love all your little touches of Christmas; it's looking so so festive! 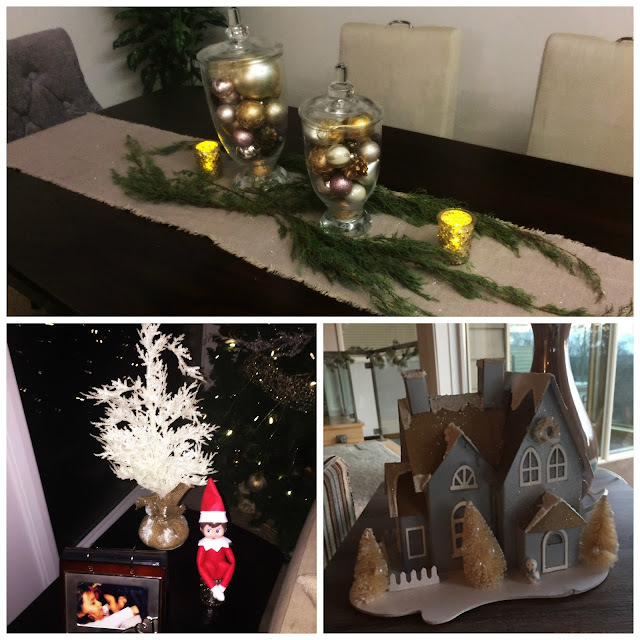 So much pretty decorations and holiday cheer throughout your house. I'm sure the girls are getting excited! I LOVE the color of your front door!! Do you know the name of the paint? I'm not a fan of my brown front door. Beautiful!! I think the girls did an excellent job with their tree. Also, I'm in awe that you can leave glass ornaments around and they remain in one piece.